What is it like to have a friend? Some say the gift of friendship is the most valuable gift in the world. I believe this is true. True friends stick by you no matter what, in good times and in bad times. February is Teen Dating Violence Awareness Month (TDVAM) and despite how scary the statistic is, one in three teens do experience teen dating violence, whether emotional, sexual, verbal or physical. If you are a teen the odds of this happening to you or a friend or someone you know is pretty high. If you know of someone please take action. Not sure what to do? Reach out. A Woman’s Place (AWP) has a teen chatline that is available Monday thru Friday, from 2:30 p.m. to 9:00 p.m. – for questions about abuse in your own relationship or how to support a loved on. They are there to listen and to help. Or you can also call the 24-hour hotline at 800.220.8116. If a close friend of yours is affected by teen dating violence, speak up. Stand by your friends in their time of need and help raise awareness on this issue. Stay informed so one day maybe you can inform others. 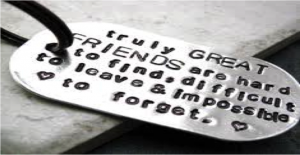 Because after all, nothing is greater than the gift of friendship.